When Cyrus Barker and Thomas Llewelyn are hired to find a girl from the upper classes who has gone missing in the East End, they assume her kidnapping is the work of white slavers. But when they discover five girls have been murdered in Bethnal Green, taunting letters begin to arrive in Craig's Court from a killer calling himself Mr. Miacca. 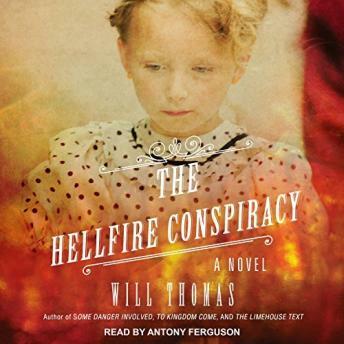 Dodging muckrakers, navigating the murky Thames under cover of darkness, and infiltrating London's most powerful secret society, The Hellfire Conspiracy is another wild ride that 'brings to life a London roiling with secret leagues, deadly organizations, and hidden clubs' (Ron Bernas, Detroit Free Press).